The Eagles secondary continues to be one of the team's most glaring weaknesses. The Eagles have been really successful in one key aspect of their defense this season — making opponents one dimensional. As one of the NFL's premier rushing defenses, they held the Vikings to 77 yards on the ground on 23 attempts (3.3 yards per run) in Sundays 23-21 loss at home. And as such, they once again forced their opposition to predictably turn to passing relentlessly. The only problem is the Eagles can't defend the pass. Like, at all. Through their four prior games, Philly had allowed 271 yards per game through the air, one of the 10 worst teams in football. Clearly it's a tale of two defenses, as the two Eagles' wins saw a pass defense that played above replacement level. On Sunday, Kirk Cousins threw for 301 yards and was able to convert 13 first downs through the air. Philly is particularly susceptible to giving up first downs to the pass, as their "bend but don't break" defense allows a lot of movement between the 20s but is among the league's best in the red zone. Through their first four games, the Birds ranked dead last in the entire NFL in opponent first down percentage, at 72.86 percent. This stat is both intriguing and understandable, as the Eagles face the highest percentage of passes thrown in all of football — due in part to their success against the run and their weakness in the secondary. Philadelphia also has allowed more than 80 percent of their defensive yards through the air, the highest percentage of any team in football. As a frame of reference, the Birds allowed just above 74 percent last year when they won the Super Bowl — also the highest in the NFL. In Week 5, the key play was not the Adam Thielen touchdown catch in the corner of the end zone allowed by the Eagles at the end of the first half, but the game changing controversial roughing the passer flag thrown on Michael Bennett after what could have been a drive-ending sack. 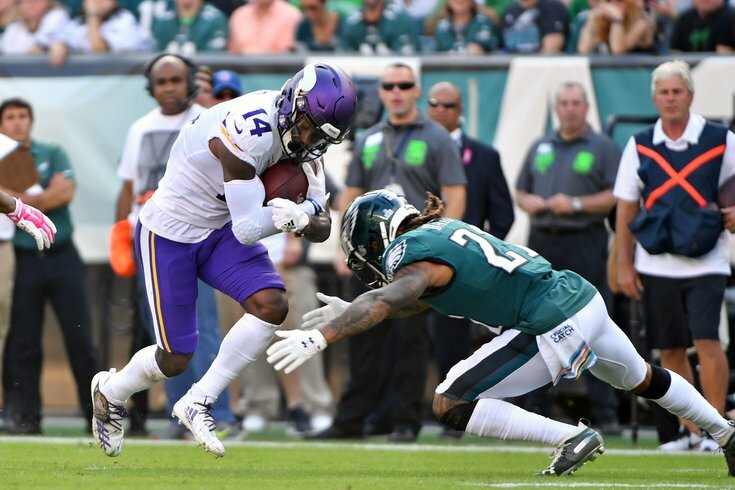 The pass defense showed they could outdo themselves a little bit later, as they allowed a 68-yard completion to Adam Thielen from their own five yard line, one play after Jay Ajayi coughed the ball up for the Eagles' second turnover. Stefon Diggs collected 25 yards on the next play before the bending defense allowed yet another field goal try, a made chip shot for a 17-point lead. While the secondary did force a big three-and-out, the Eagles relented their best chance to grab a lead in the subsequent offensive possession. When the Vikings got the ball back, they were able to march from their own 10 yard line (mostly through the air) deep enough into Eagles' territory to set up Dan Bailey's insurance 52-yard field goal (making Zach Ertz' late touchdown catch more or less irrelevant — pending the team's unsuccessful onside kick attempt). There is no possible way the Eagles secondary can continue playing like this, and even though they played themselves back into, and later out of the game, another Odell Beckham explosion could be the Eagles' next setback in four days when they are back on the field — potentially without cornerback Sidney Jones, who left in the fourth quarter with an ankle injury.